Paul Marshall of Granite Falls, Washington, was very proud on September 1, 2013, when he launched his Yankee Tender after 30 years of (as he says) working on it in "fits and starts." 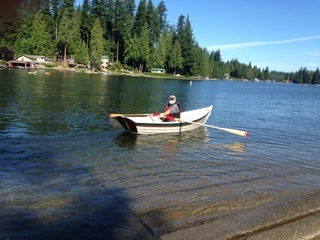 She is the 12′6″ × 4′6″ design from WoodenBoat based on an Asa Thompson skiff design. 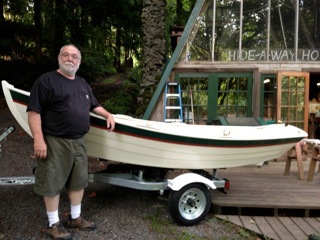 He built her from plans bought at The WoodenBoat Store. Paul made the frames from oak, the planking from western red cedar, and the transom from Honduras mahogany. 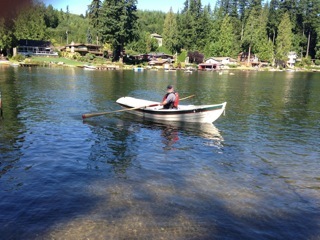 He adds that with his homemade Sitka spruce oars, she handles as well as he could have ever dreamed.